MD/PhD student at the Icahn School of Medicine at Mount Sinai, New York, NY. read a little more about the details of the thesis, its abstract, and links to the publications derived from its chapters. I’ve also put the source code for typesetting the thesis on my GitHub. Discuss this post on HN. 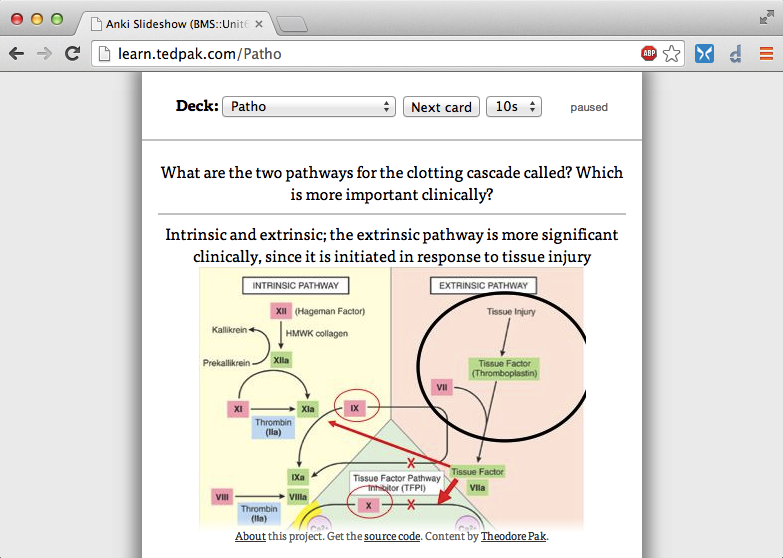 I’ve started putting all my medical school flashcards on this website using some Python and Ruby. Read how I did it below, or get the source code. I’ve been using Anki to generate flashcards for just about every class in medical school since the second semester, and it’s been clutch for trying to memorize the insane amounts of material that we’re given. I’d say that Anki is almost perfect for medical students and the reasons why deserve a post all to themselves. This post, rather, is about something that I thought was missing from Anki—namely, publishing the content to the web—and how I wrote some code to fix it, all thanks to Anki being open source and extensible. Most people think using open source software is an ideological consideration, but as a student, it can be just as much a practical benefit. Students are already reliant on so much software, from office programs to course management systems, much of it proprietary. It can be disastrous when those apps become unsupported, stop working on your new device, or worse, lose data. Imagine taking a semester’s worth of notes on a shiny new website or app that you tried because it was free or had some killer feature that you couldn’t resist. Then the company goes out of business, and the website shuts down. Or, your computer breaks, and the app doesn’t work on your new one. Maybe the company decides to disable support for exporting content unless you pay a huge fee. These situations are terrifying—especially if you have a test, much less a career licensing exam, right around the corner. As it turns out, Anki is exceptionally customizable. Since the desktop app is written in Python with bindings to Qt for the GUI, not only is it cross-platform, but it supports writing plugins as Python scripts, called “addons”. That means: no compiling, everything lives in one text file, and live objects can be debugged in a console. Sweet! You can do everything from GUI alterations to enhancing internal data structures or the scheduling algorithm. There are quite a few addons already available online. That brings us to my problem: most kinds of content have a “natural” online destination for sharing: Flickr and Instagram for photos, YouTube for video, Slideshare for slide decks, and Scribd for office documents. Anki doesn’t really have anything in the same league. Yes, there’s AnkiWeb, but it’s designed to be used primarily as a sync backend. An account is required to do anything, it has less features than the desktop app, and the sharing functions are pretty limited. There are a few gems hidden in there for medical students, but in general it’s hard to find, share, and show off good Anki material. This throws an extra section with two items onto the end of the Tools menu of the main window. Clicking on these items runs the functions written at the beginning of the script. In short, this means that if you go to the bare domain, you’re redirected to a random deck; if you fetch a URL ending in “.jpg”, it grabs the picture (if there is one) and serves it. If the URL is anything else, it looks for a deck with that name and serves a random card from it. That $.scrollTo() call provides a nice animated transition to the reverse side of the card in case it is off the edge of the screen, using the very nice scrollTo jQuery plugin. To embed the web app into another page, an <iframe/> element with a src attribute pointing to one of the decks can be used. For example, this is how I can embed my Cardiovascular deck. It produces the following, which I’ve highlighted with the frameborder="2" attribute so you can see where its edges are. But those can be turned off by setting frameborder="0". I was happy to be featured in a video produced by my medical school about life as a first year student here. Since it was filmed throughout the entirety of first year starting from the white coat ceremony, and now I’m knee-deep in the second, it’s interesting to look back and remember snippets of how it all went down. It was shot in a hands-off style: besides coordinating when the crew would be where, and the “debriefing” interviews, we as students pretty much did our thing and the cameras rolled. The video is sincere about the culture and mission of the school, with the essence of our experience as first-years conveyed quite honestly. There are a lot of special things about Mount Sinai that I’ve already discovered in the short time that I’ve been here. Most of all, what makes Sinai especially great are the students and faculty here, and I was happy to see the video let the students’ thoughts and personalities speak for themselves. Ultimately medical education is about the people around you, so you should never underestimate the impact of a happy and well-rounded student body. Hopefully applicants see the video and get a more personal sense of what Sinai is like. If you’re applying to Sinai and are interested in anything that you saw or heard about, feel free to email me!